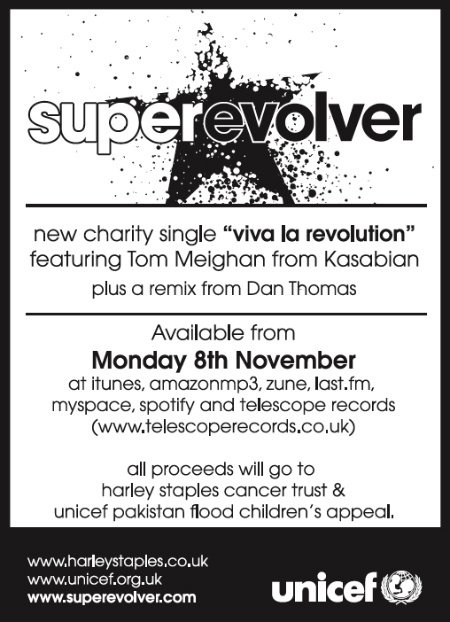 SuperEvolver have teamed up with Kasabian front man Tom Meighan to release a charity single ‘Viva la revolution’ . All proceeds go to Harley Staples Cancer Trust and UNICEF’s Pakistan Flood Children’s Appeal. We are looking forward to having the band play for us live at Pull up the Roots 15th December at The Monarch in Camden. 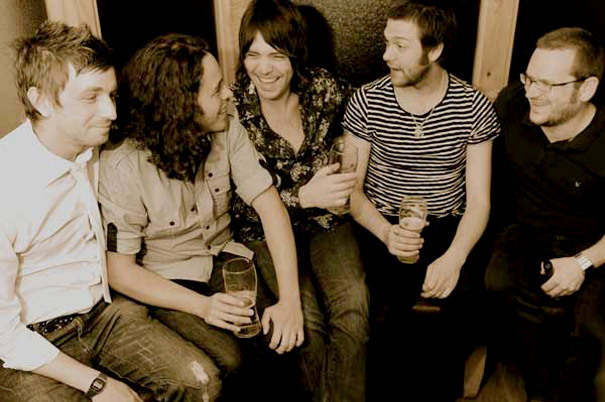 TOM MEIGHAN has teamed up with Leicester band SUPEREVOLVER to record a charity single. Viva La Revolution, out on November 8, has a very KASABIAN feel. Kasabian’s Tom Meighan is to feature on a new single from fellow Leicester band Superevolver to raise funds for UNICEF’s Pakistan Flood Children’s Appeal and the Harley Staples Cancer Trust. To date, the flooding in Pakistan has affected over 18 million people, around 9 million of them children. A disaster of unprecedented scale, all five provinces of the country have been affected. UNICEF’s Pakistan Flood Children’s Appeal is raising £90 million to scale up the distribution of clean water, vaccinations and rehydration salts. The Kasabian frontman has put his unique vocal stamp on Viva La Revolution with Superevolver, joining them in pledging all proceeds from sales to UNICEF and the Harley Staples Cancer Trust, a Leicester charity set up in memory of local eight year old Harley, who lost his battle with cancer last November. In addition to Tom doing his bit for charity, work on the single must be a welcome distraction from the lack of Kasabian activity at the moment, with the band taking a break to concentrate on family. We reported last month Tom would be working on solo material, could this be a taster for things to come? Written by Superevolver frontman James Mabbett, Viva La Revolution featuring Tom Meighan will be available to download from iTunes, Amazon, Zune, last.fm, Myspace and Spotify from November 8th through Telescope Records. The download also features a bonus remix from Dan Thomas. Posted on November 4, 2010, in Music, new music and tagged band bookings, broccoli events, Broccoli Music, camden, Charity singles, Harley Stapels Cancer Trust, Kasbian, Monograph, new music, Pakistan Flood Children's Appeal, promoters, Pull up the roots, SuperEvolver, the monarch, The Sun, The Sun Show Biz, Tom Meighan. Bookmark the permalink. Leave a comment.